In our New Year’s post, we used a photo of a hamburger container collected recently from a nearby MacDonald’s restaurant. Our point was simply to demonstrate the continuing relevant of certified products in the commodity marketplace – and by extension the ongoing relevance of the FSC, SFI and PEFC brands. 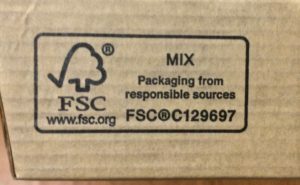 MacDonald’s buys a lot of burger boxes, so the fact that they have FSC labels on them is – by definition – a pretty big deal. Because we are interested in the details of this sort of thing, and curious by nature, we looked a little closer; and uncovered a story that we hope you will find interesting. “MIX” – The FSC Mix Label is the most common type used by the program. It links the underlying product to one of the FSC “mixed source” claims. It tells us that this product is made from forest-based raw materials from some unspecified combination of “eligible” categories that FSC recognizes as responsible sources. In this case, we think, much of the content is recycled fiber. “Package from…” – This statement is intended to clarify what is certified and what is not. In other words: an FSC-certified burger box, NOT an FSC-certified hamburger. “FSC C129697” – This is the trademark license code that was used to authorize the use of this label. Using it as a search term at www.info.fsc.org, we can see that the package was manufactured by a company called LBP Manufacturing LLC, in Chicago. 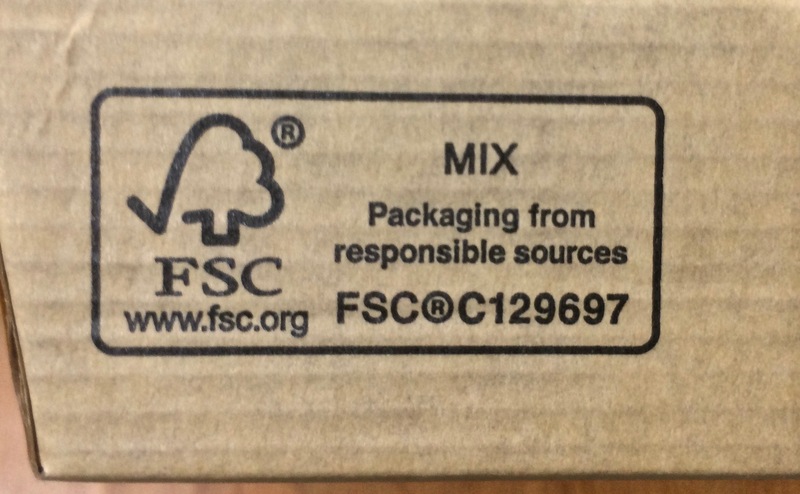 It turns out that MixedWood were not the first to notice the FSC labels appearing on MacDonald’s burger boxes this year. We were delighted to discover this exchange on Twitter from October. We blocked Wilhelmina’s last name and ID out of respect for her privacy. She deserves a lot of credit for taking such a personal interest in her own environmental footprint. Not only did she inquire once, but she followed up again a week later. Conventional wisdom suggests that this sort of detail is not interesting to American consumers. This lady seems to disagree. 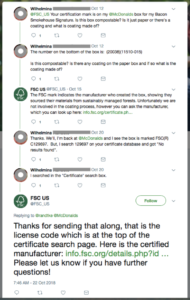 Wilhelmina’s initial question about compostability raises an important and rarely-discussed weakness that FSC has in common with SFI and PEFC. They tell us things about forest-based raw material, but little or nothing about other non-wood inputs, nor about their end-of-life fate. The reply from FSC-US helps to clarify this, but in a way that is just a bit misleading. The FSC label on the MacDonald’s package does verify its manufacture from FSC’s version of “responsible sources”. It does not, however, show that they “sourced their materials from sustainably managed forests”. A minor distinction perhaps, but we think worth a note.